Bookings will only be held for ½ an hour for all nominated members to arrive, i.e. not 1 or 2 members. The room will be re-allocated to another student if all nominated members fail to appear. Every effort will be made to accommodate students’ needs, however, MGSM cannot guarantee that a room will be available on the date and at the times requested. 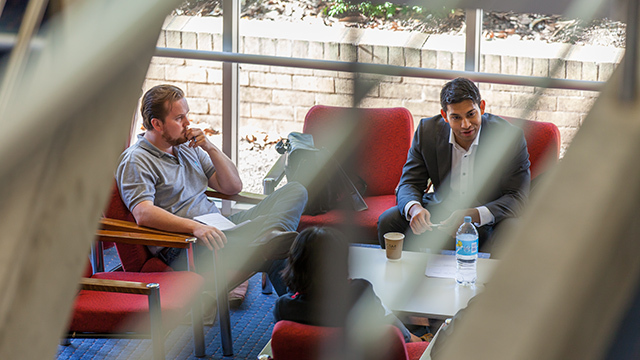 On those occasions when there are no syndicate rooms available for student use, private study group rooms are available for use in the University Library. Software Support provides information on how to access your Macquarie University student email account, Macquarie University IT help support services and access to iLab (a "virtual computer lab" allowing you to use the Microsoft Windows and Mac OS X applications required for university work from anywhere in the world). OneNet WiFi is available for use by students via the "Macquarie OneNet" SSID. OneNet WiFi provides users with campus wide coverage. Students will use their OneID and password if they wish to connect wireless devices including laptops, iPads, iPhones and Android devices.